The TP-Link AC1200 Wi-Fi Range Extender RE305 is a great buy for the budget-conscious Wi-Fi user looking for style, functionality, and easy setup. If you live in a larger house or even an apartment where a central router is too far from your dwelling, you may experience poor connectivity issues or even dead zones where connect to the internet. That's where wireless range extenders come in. 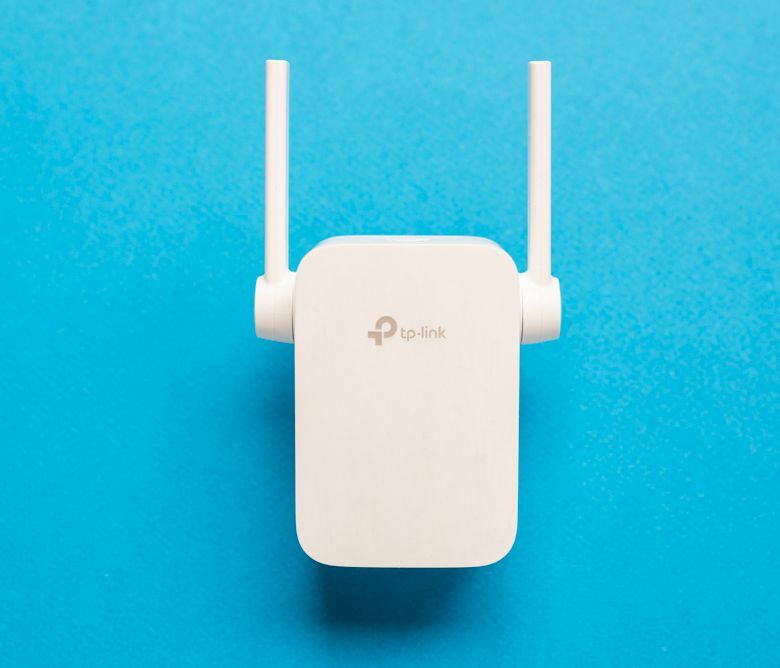 By using them to "piggyback" onto an existing wireless connection, you can extend a wireless signal to areas in your home previously bereft of Wi-Fi. The TP-Link AC1200 Wi-Fi Range Extender RE305 is a value-priced, no-frills extender that promises quick setup, a low-key design, and typically smooth connectivity at a great price. We spent over a week testing it in our home, evaluating design, ease of setup and network performance. The RE305 is quite small and unobtrusive, with a plastic white exterior and silver accents that’s meant to blend in, not stand out. At just 3.1 x 3.1 x 2.4 (LWH) inches unboxed and 6.4 ounces, it's one of the most diminutive Wi-Fi solutions on the market. That means it's simple to plug into a spare outlet anywhere your wireless signal needs bolstering. The two wireless antennas on either side of the unit can be adjusted to your needs, and the WPS button on the top of the device has a nice, hearty click to it when you press it. Both sides of the device feature plenty of ventilation as well, in case it starts running warm, though that was never an issue when we put it through its paces. It could be easily mistaken for one of TP-Link's smart plugs since both are similar in size. One important thing to note is that the RE305 will not take up an entire electrical outlet if placed on the lower plug, but utilizing the upper plug will mean your antennas will block the other outlet. The RE305 is quite small and unobtrusive, with a plastic white exterior and silver accents that’s meant to blend in, not stand out. There's an Ethernet port at the bottom of the device as well as a pinhole reset button, just in case it needs rebooted at any point. It's a bit awkward to hang an Ethernet cord from the extender depending on where you've placed it in your home, but it's a useful addition to bring Ethernet to a desktop, TV, or gaming console without having to put holes in your wall. Setup is extremely simple. There's no software required to install with the RE305, and it’s very quick to set up. It takes a matter of minutes to get it up and running via a web browser. There's a Quick Installation Guide included that outlines out the process. We found it painless to follow. First, you plug in the extender to an outlet, then use any computer to connect to its network. After plugging it into an outlet, we found that it popped up immediately on our MacBook Pro's available wireless network list. Once connected to the network, setup is done via the web address listed on the guide. You'll create a password, let the device scan your network for an applicable router, and then enter the SSID and password to your current wireless network from there. There are options to change the extender network’s SSID and password if you so choose, but otherwise, it’ll remain the same as your default network. Once completed, the 2.4 GHz and/or 5GHz lights on the device should come on, depending on your router's functionality. The entire process from unboxing to surfing the web took about 7 minutes. If preferred, you can download the TP-Link Tether App for either iOS or Android devices to manage the extender via mobile devices. It's as easy as downloading the app and then making sure you're utilizing the same wireless network the extender is connected to. The RE305 is a value-priced, no-frills extender that promises quick setup, a low-key design, and typically smooth connectivity at a great price. There is one important pain point, however, to keep in mind during setup. The extender's administrative password utilizes a default "admin/admin" login, so you'll want to change that to keep unauthorized users out. It can be changed via the TP-Link Tether app, which isn't clearly lined out in the instructions. It isn't required, but if you want to keep your network as secure as possible, it's an important part of setup. Several devices were connected to our wireless network, including a MacBook Pro, iPhone X, iPad Pro, Nintendo Switch, and PlayStation 4. When testing the wireless extender's range, at 10 feet to around 70 or so feet away from the router in a 2,100 square foot home, its signal was quite strong, with full bars on an iPhone X and iPad Pro in most areas. One bathroom on the first floor did suffer from occasionally spotty connectivity at around 1,500 feet away from the router. Out in the yard, there were occasionally drops in connection, particularly when trying to load YouTube videos or play online games via mobile devices. Speeds didn't usually waver, however, though we didn't quite get the full 300mbps our wired connection typically summons. The product advertises 867Mbps on a 5GHz connection and 300 Mbps on a 2.4Ghz connection, so it did provide what was promised, albeit with some dropouts over the five-day testing period. The browser-based setup procedure couldn't be easier, and there's no extraneous software to concern yourself with save for the aforementioned optional app for device management. It's a pleasant, minimalistic mint green website with a clean interface and easy-to-read text. Two tabs at the top include the Quick Setup option or Settings, where more advanced users can tweak options to their liking. It's a bit bereft of some functionality for veteran extender users who may want to fiddle with settings and skip the "easy mode" setup, but it does its job particularly well. It even includes a QR code to scan for users to download the wireless management app straight from the setup page. It doesn't take any real doing to reach this website either, and can be accessed at any time from the network. At a list price of $59.99, the RE305 is a fantastic deal, considering it's typically on sale for much cheaper, often $10 to $15 less than retail. It isn't TP-Link's lowest-end option, but the performance and speeds offered for the price are certainly more than your money's worth, especially if you live in a larger home and pay for higher internet speeds. It’s important to keep in mind that it won’t include all the features you’ll get with pricier extenders like multiple ethernet ports or additional antennas, but this basic setup is just about all the average user needs, anyway. There are a variety of different extenders on the market with similar price points, and many are pricier, with fewer promised features and lesser range. If you’re looking to stay “on brand,” you might opt for competition such as the Netgear EX3700, but there’s no real reason to do so when they offer a good amount of the same features for a similar price. We also found the RE305 to be much more aesthetically pleasing overall if that’s of importance to you. See our other reviews of the best wi-fi extenders. A no-frills option for smaller homes. The TP-Link AC1200 Wi-Fi Range Extender RE305 is a no-frills extender with supports dual-band Wi-Fi support and an Ethernet port for wired connectivity. It won’t fare well in homes beyond 2,000 square feet, but it's a value-priced extender that can be relied on at shorter ranges. Product Dimensions 3.1 x 3.1 x 2.4 in. Does Your Laptop Have Poor Wi-Fi Range? Should You Upgrade to a Mesh Network or Just Buy a Wi-Fi Repeater? How Far Will Your Wi-Fi Reach?